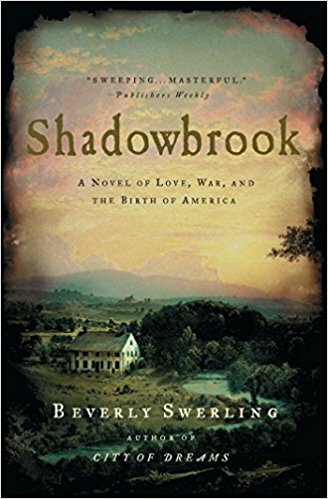 I don’t know how I didn’t discover Beverly Swerling until now, but wow–Shadowbrook was right up my alley! Scouring Amazon for 18th Century fiction paid off! Shadowbrook takes place during the Seven Years War (French and Indian War), and for anyone who doesn’t know, I have an obsession with the Daniel Day-Lewis version of Last of the Mohicans so of course I dove right into this story. If you do as well, you will love Shadowbrook. It’s also very Diana Gabaldon and Sara Donati, and I wonder if Beverly Swerling was influence by either when she wrote this novel? Shadowbrook starts on the eve of the war between France and Britain, with Quentin Hale and his half-Potawatomi, half-Irish adopted brother Cormac Shae caught in the middle, along with a young woman named Nicole Crane who wishes to become a nun in Quebec. Things quickly go awry as the three of them get swept up in the tumult of the Ohio Valley, where we also meet a young and inexperienced George Washington. Quentin and Nicole begin to form a close relationship at his family seat, Shadowbrook, and Nicole struggles with her wish to become a nun. Much of Shadowbrook delves into the politics among the tribes stretching from the Ohio Valley, across to Delaware, and up into Canada, and what they will do when Britain and France finally declare war. We see much of the politicking and cultural differences through Cormac, and also a bit through Quentin who is an adopted member of Cormac’s Potawatomi tribe. Having written something similar, I very much appreciated Swerling’s research and differentiation between each tribe culturally. As I wrote Light and Stone, I often struggled with (and still do) the fact that I am a white woman writing about native experiences in the 18th century. No matter how much research is done, is it still right to do that? Do I even have a right to write about it, etc. However, I did not feel as if Swerling resorted to stereotypes, but rather relied on her research. Now me, as a white woman judging another white woman’s writing about indigenous peoples probably doesn’t hold much weight, but that was the sense I got. There were only a handful of times where I recognized the old crutch/trope of “mystical native person,” even a bit with some of the slave characters, but overall I had to keep in mind the historical context. I do think that Swerling was well intentioned with her portrayals, however I totally understand native writers wanting to tell their own stories and I’m 100% on board with that. Shadowbrook is a meandering narrative, and although I enjoyed it, I have read longer books that seemed to go back faster/read much faster than this one. Swerling often deviates from the A and B plots to these random side characters I didn’t really care about, and could have done without their little off shoots, because we ended up not really knowing them at all in the end. Another thing I wasn’t crazy about is the POV head hopping within the same scene. This choice often left me disoriented until I figured out whose thoughts I was reading as opposed to whose thoughts I was reading maybe only two lines up. I was most connected to and interested in the relationship between Quentin and Nicole, whose relationship is quite star-crossed, and I often wanted to get through the meandering conversations between Jesuit priests and French Generals to get back to that story. That said, Shadowbrook is a sweeping, epic tale of war and love spanning 1754 to 1769, delving into the little known political machinations and social history of the French and Indian War–a war that was integral in setting the stage for the coming Revolution.